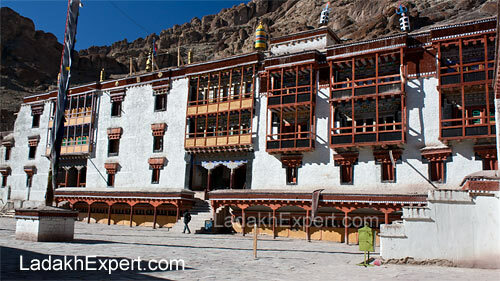 Hemis Monastery is the biggest and richest monasteries in Ladakh and also one of the oldest, having been founded by the 1st Taktsang Repa, Ngawang Gyatso in 1630 AD. 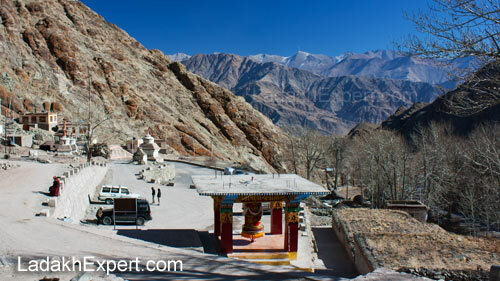 47km drive from Leh to Hemis will first take you on the Manali – Leh Highway till the town of Upshi, little beyond which the small yet scenic diversion for the Hemis Monastery begins. Once you travel through the small yet curvy road to the parking of Hemis and park your vehicle in the parking lot just before the Monastery, you would be greeted by this large and beautiful Buddhist Prayer Wheel with a wonderful view of the valley. Walking in to the Hemis Monastery, one starts coming to terms with the scale of Monastery, which might look smaller than Thiksey Monastery from outside, but is actually bigger and more imposing. However once inside, Hemis Gompa has that old world charm and tranquility, which can only exist in such ancient monasteries and even though we had to walk barefoot in the month of December, with the outside temperature hovering around -8 Degree Celsius, we couldn’t help but feel peaceful and happy to have had the chance to visit such a beautiful and ancient monastery. 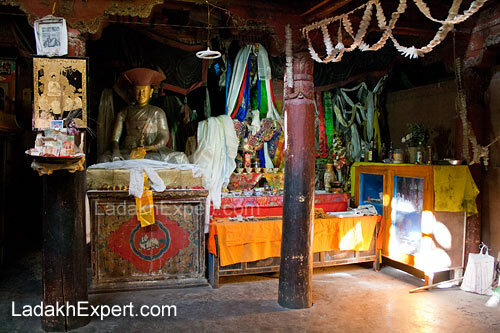 Hemis Monastery is open from 7:30AM to 6:00PM each day with one hour lunch break at 1pm and can be easily visited while going to or coming back from Tso Moriri or as part of dedicated tour of monasteries around Leh. Additionally, each year Annual Hemis Festival (Hemis Tseschu) is held on the 9th, and 10th, day of the 5th month of Tibetan Calendar. (see: Ladakh Monastery Festival Calendar 2014).